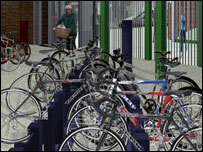 Kingston upon Thames in south-west London is the most notorious place for bicycle thefts, a report has found. Half a million bikes, with a value of more than £113m, are stolen every year in the UK, according to figures from Halifax General Insurance. More than half of the thefts take place directly outside the home and 14% of bikes are taken from inside the home. Other areas which had a high rate of bicycle thefts last year include Cambridge, Bristol and Oxford. Vicky Emmott, of Halifax, said pressure to use greener transport combined with the July bombings had led to a resurgence in people riding bikes. "Cyclists should ensure that their bikes are post-coded, securely locked and out of view. "Given the amount of warnings and the low cost of purchasing of a good lock, it is surprising that so many people still leave their bicycles unsecured," she said.